Not all of them like to play safe with sarees. At least, the experimental kind! Sarees, though still remains the embodiment of true traditional attire, often has its fashion moment too. These stylish moments can be achieved through many means. 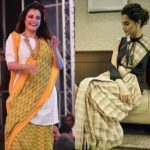 From belting the saree for a structured look, to wearing them with sleek pencil pants for a fusion style, our fashion icons have been iterating the age old drape in many voguish ways. 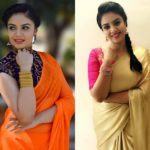 Needless to mention, how a trendy blouse can transform your entire saree look altogether. In the endless way, to make saree look modern, now comes another notable style. Yes, it’s by constructing your saree style to make a statement by wearing see-through capelet. Cape blouses are not new in celeb world. We have already seen many actress giving their own spin to this much coveted runway blouse model. 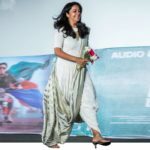 But the fact is, this fancy saree blouse still remains an unexplored option by many Indian IT girls who love to style them with sarees. If you are in dilemma as to whether this tricky blouse pattern could actually work in your favor, then you need to take the inspiration from Esha Gupta this time. 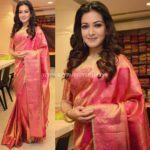 The pretty women lately sported a gorgeous Payal Singhal saree and finished it off with a delicate cape blouse that completely stole the show. It’s quite undeniable that Ms.Gupta made the tricky blouse highly wearable by showing the right way to style them. If you like to give this blouse a try, make sure you chose wise fabric and color for it, because, it will make all the difference. 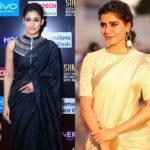 Would you try experimental blouses for sarees? Drop and let us know your comments.